Ripple prices bullishxRapid adoption should be a top priorityTransaction volumes picking up after Feb 8 gainsShoring our optimism is the expectation of xRapid adoption. Binance is open for a partnership while Ramessa Online is waiting for further clarification before incorporating XRP. In the meantime, XRP is on an upward trajectory, and we expect bulls to drive prices above 34 cents triggering the first wave of sellers aiming at 40 centsRipple Price AnalysisFundamentalsExecutives at Ripple continue to broadcast their objectives of continually building a superior platform where financial institutions can use to send and receive funds efficiently.With xCurrent gaining traction, all eyes are on xRapid, a product that makes use of XRP. While adoption of xRapid is what XRP investors need should they want to see immediate demand and consequent lift off, there are regulatory challenges that put a lid on their ambitions.All the same, the expansion and contraction of this asset mainly depend on how regulators interpret XRP and later the speed at which they will onboard customers. It is the first conditions that must be defined before we see payment processors as Ramessa Online incorporate XRP and enjoy unparallel speed and cost savings.Candlestick Arrangements At the time of writing, XRP is stable in the last day and hovering around last week’s close. Because gains were not as strong as those of Ether (ETH), XRP is down to third with a market cap of $12,520 million. 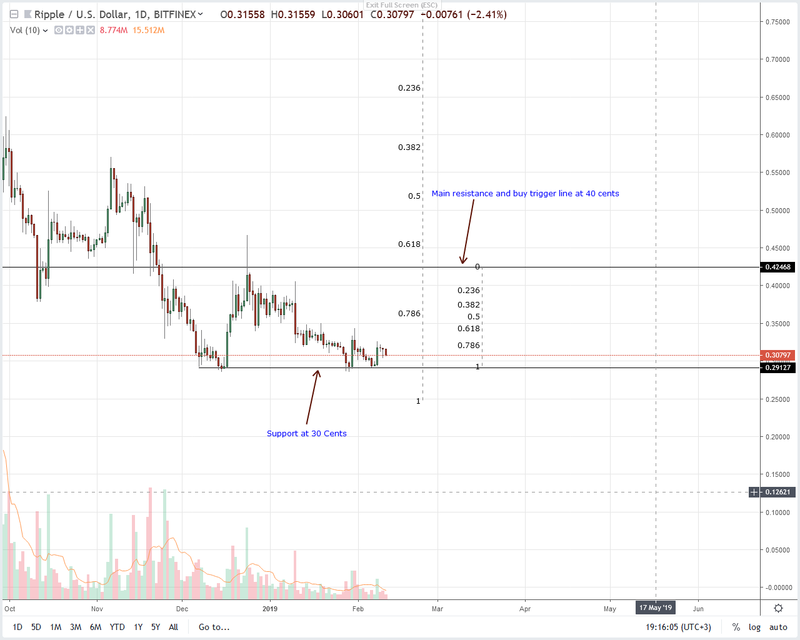 All the same, our previous XRP/USD trade plan is valid. Every dip is technically a buying opportunity, and it is easy to see why.From the chart, surges of Feb 8 did confirm gains of Jan 30 which also mirror upswings of Dec 17. While we are optimistic, our trade conditions are not valid. It will be so when prices thrust above Jan 14 and the 61.8 percent Fibonacci retracement level at 34 cents. Once that happens, our first targets will be at 40 cents and later 60 cents.Technical IndicatorsOn average, momentum-shifting volumes must exceed 42 million. That will exceed those of Feb 8’s 35 million but fall short of Jan 30’s 49 million but all the same, it shall thrust prices above Feb 8 and Jan 30 highs towards 40 cents.